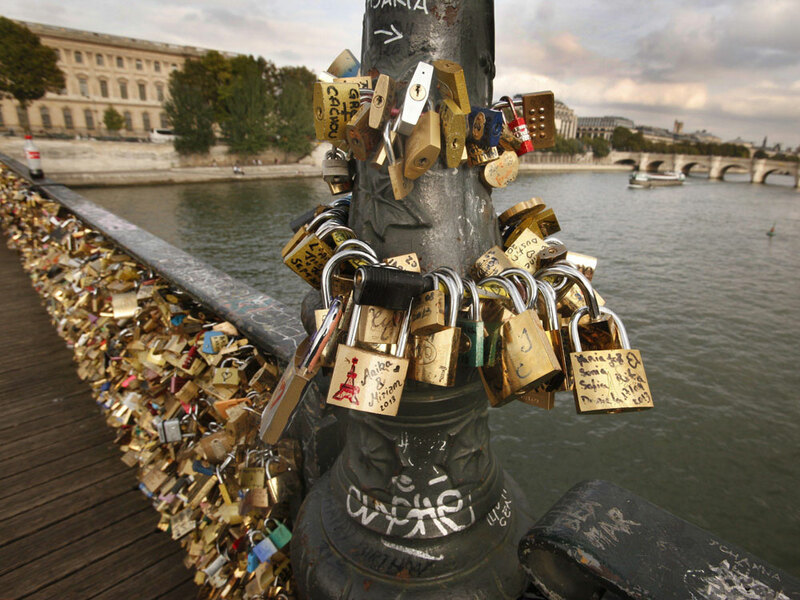 The lovers of Paris are heartbroken today, as ‘love locks’ are forcibly removed from bridge. There will be heartbroken couples all over Paris today, as city officials have begun to remove ‘love locks’ from a bridge in the French capital. Pairs’ Pont des Arts has long been a mecca for loved-up tourists. Many have purchased padlocks for a few euros from street vendors along the banks of the river Seine, inscribed them with their initials and affixed them to the railings of the bridge before tossing the key into the river, to symbolise love’s eternal bond. There are believed to be almost a million of these so-called ‘love locks’ attached to the bridge’s iron grillwork, which overlooks the Eiffel Tower. But, underneath the saccharine romantic metaphor of the love locks, lies the risk of destroying an iconic bridge. First built in the 1800s, part of the Pont des Arts collapsed last year under the weight of the padlocks – purportedly amounting to 45 tonnes. Paris’ Deputy Mayor in charge of culture, Bruno Julliard, has said that the padlocks must be removed to preserve the bridge and prevent accidents and that the removal of the locks was vital for safety reasons. Others have expressed their distaste for the locks, seeing them as eyesores, that have defaced an historic landmark. Two friends, Lisa Taylor Huff and Lisa Anselmo, started the No Love Locks campaign last January, calling for the removal of the locks which they described as ‘spreading like fungus’ across the city, the BBC reported. Officials have started to remove the padlock-loaded panels, which will be replaced by flexiglass, to put an end to the tradition and enable to river to be seen through the bridge, once again. Mr. Julliard says the panels will be kept in a warehouse until they can decide what best to do with them. Options include melting the locks down, or keeping the panels as works of art. The Pont des Arts is not the only bridge affected, officials have also begun removing locks from the Pont l’Archevêché and other bridges have been targeted by over-zealous lovers. There are said to be an estimated 700,000 keys at the bottom of the Seine, flung in by romantic tourists. The trend has even spread to other cities, including London, New York and Rome, the latter issuing fines for anyone caught affixing a lock. Mr. Julliard has insisted that despite the removal of the locks, Paris will continue to be ‘the capital of love, the capital of romance.’ Couples have been persuaded to opt for a romantic selfie instead of affixing a love lock. We don’t yet know how many couples have broken up as a result of this news, but only time will tell. Love’s labour’s lost, indeed.